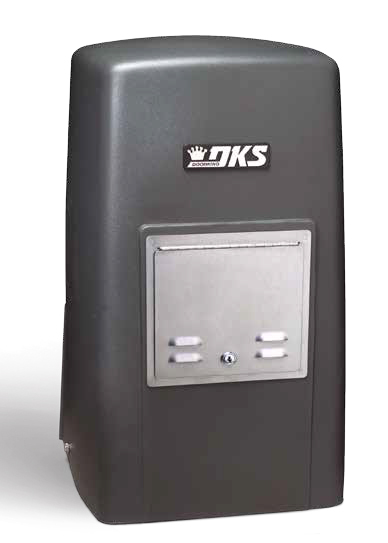 The new DKS 9024 Slide Gate Operator keeps running when AC power has been lost. The solar power version is ideal in applications where AC power is unavailable and allows you to add your own solar system for power, or you can choose the DKS solar kit. This slide gate operator offers convenience, reliability and safe operation in a small, compact design and is ideally suited for residential or commercial applications. The 1/2 HP Quadra Drive DC Motor provides powerful and long lasting operation and is backed up with built-in 7.2 Ah batteries to provide operation if AC power is interrupted. For longer backup operation, optional 18 Ah batteries can be chosen for up to 150 gate cycles*. The 9024 features a belt drive/30:1 gear-box reduction system to provide powerful, yet extremely quiet, slide gate operation. The 9024 uses an advanced microprocessor control circuit with outstanding features. Designed with versatility in mind, the DKS Model 9024 provides everything you expect from a gate operator in this class – and more. *Assumes a 16 foot gate weighing 1000 Lbs. Other external factors (temperature, charge state of batteries, gate weight, gate length, etc.) will affect the performance of the gate operator and may reduce the number of cycles shown. DC Powered Operator Only - 0.0 Amp SBPD(PatPend) Circuit insures longer battery life.